Back last June, 2016, I wrote a special article on the late sculptor Michael Malpass. It was quite a story of synchronicity in the universe how I discovered the artist and his work which was being exhibited along with a biographical documentary at Monmouth University, Pollak Gallery. Yes, I was totally overwhelmed with the depth and introspection of Michael Malpass. 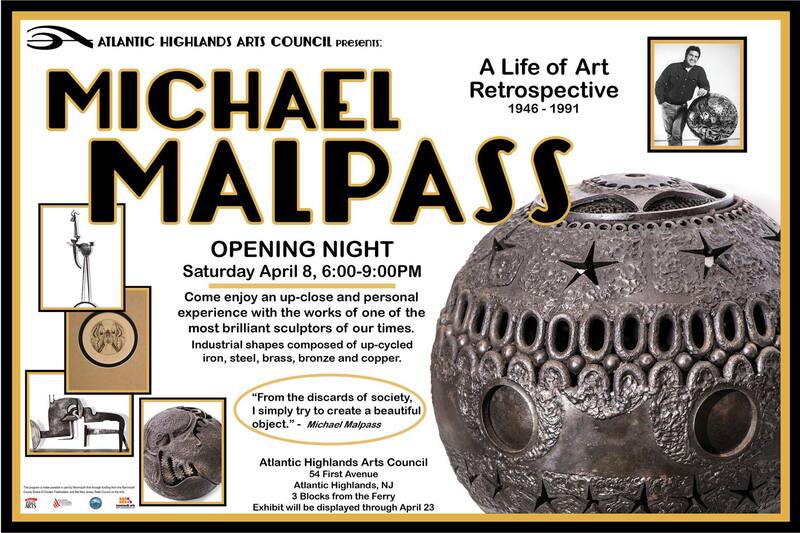 The focus of this article is to let you know what I discovered last year in Michael Malpass’ extraordinary body of work and legacy and to let you know (the flyer at the bottom of article) that a wonderful new exhibit is taking place at Atlantic Highlands Art Council. 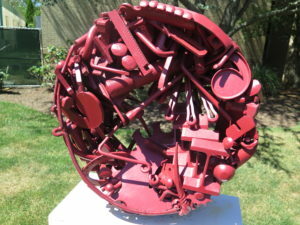 “I walked towards Pollak Gallery and noticed magical spherical (Malpass’ specialty) sculptures on the grass to my left. Walking on the grass, towards the sculptures, observing their artistic splendor, I was now frozen, staring, haunted by the intricacies and detail of his work; one cast in stark celestial red. The anticipation of the exhibit was peaking for me. Fortunately, they extended this exhibit until August 18th because of the demand/volume. 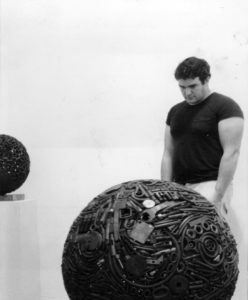 I stopped in front of a sculpted sphere called ‘Squiggly.’ I day-dreamed that I was in the studio with him while he created it. We were laughing together. Then he got serious and ushered me away. 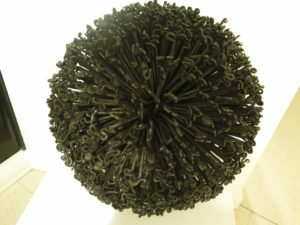 I loved, ‘Traveler’ one of the most imaginative and perfect world of unions and coming together of form pieces. It seemed so many stories were being told here; a perfection of function and form so simple yet intricate. He was traveling and encountering so many foreign objects but made them(welded) in a smooth statement. He must’ve travelled far and wide to bring the ‘ingredients’ together. More sculpted magic of Michael Malpass. 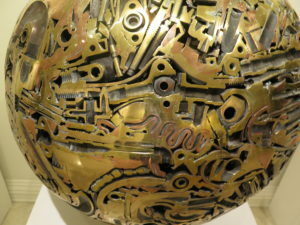 With each exhibited piece, I imagined and wondered about his mind and thought process during inception. So many questions to ask him. It’s a rewarding feeling to leave an art exhibit with unrequited love of the works of the artist. Each piece told me a story. It’ll tell you all stories. Michael Malpass was one of the most respected sculptors of the 20th century. The flyer: Perhaps even try to get to opening night of the exhibit.